IT’S MID-FEBRUARY. It is cold, cold, and freezing. That’s a given. Except today it won’t be. It’s going to be warm as a summer (well, at least a pleasant spring) day. 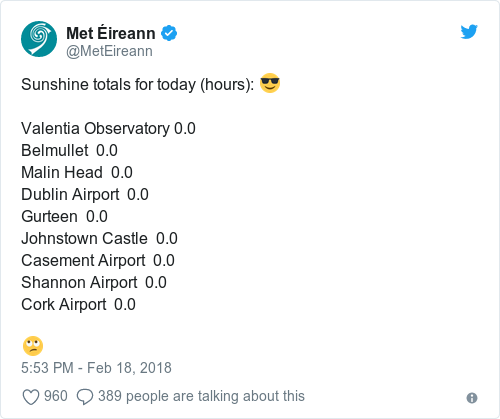 According to Met Éireann, we can expect temperatures of between 10 and 13 degrees celsius today. Considering it’s only about a week since the thermometer was dropping below zero at night-time, that definitely feels like progress to us. The forecast says that mist and fog will gradually clear this morning, before a dry spell and “cloud breaking at times to allow some sunshine through”. Lordy. There’ll be some rain in the afternoon developing in the west before moving cross-country, with some southwest breezes also thrown into the mix. Tonight will be clear, but normal service will be resumed – temperatures of between one and three degrees, with widespread frost expected. Tomorrow and Wednesday should be a deal cooler – top temperatures of between seven and nine degrees – so enjoy it while you can. Email “It is, no messing, going to be properly warm today”. Feedback on “It is, no messing, going to be properly warm today”.